Ignition Casino is a fairly new online casino that’s only been around since early 2016. Despite their short history, they’ve proven themselves to be trustworthy, and that’s helped to make them a great option for US players. Because they accept bitcoin in addition to a number of more traditional payment options, they offer a lot of flexibility when it comes to deposits and withdrawals. Their license from Kahnawake shows that they can be trusted since Kahnawake is one of the more strict jurisdictions for online casino licensing, and they’re operated by Lynton Limited which is part of the Bodog/Bovada family of sites. So they are very reputable and always pay winners on time. 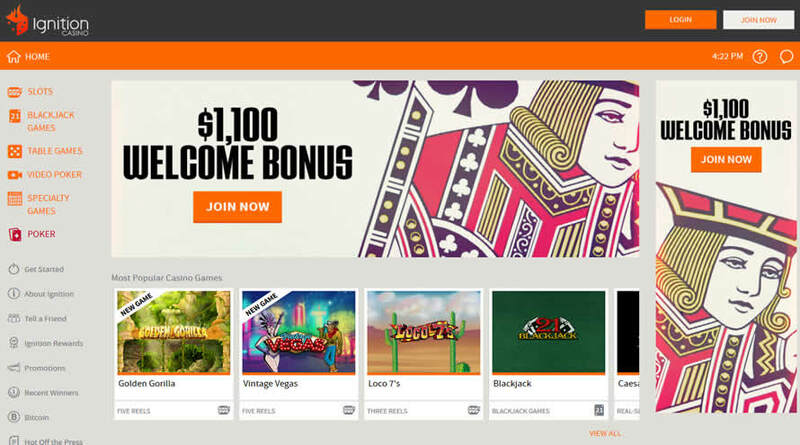 While this online casino frequently offers bitcoin-related promotions and other special offers, they have a tremendous welcome bonus as well. Players can get a 100 percent match on their initial deposit worth up to $1,000. What makes this deal even more attractive is that it’s completely cashable, and there’s a base wagering requirement of 25 times the sum of the bonus and the deposit on slots for this offer, though many other games can be played for this bonus with varying play-through requirements. That’s a great way to kick your bankroll up to a new gear and start off on the right foot playing at this casino. The software used at Ignition Casino includes a combination of titles from Realtime Gaming, Rival Gaming, BetSoft and their own proprietary software. This means you’ll get one of the best mixes of titles that you can find at any US-friendly online casino, and they can all be played with bitcoin. What’s really awesome about this software is that you can run it through your web browser, so you don’t need any special download or a certain operating system or type of computer to run it. If you have an Internet connection and an updated browser, you’re good to go no matter if you use Windows, Linux or Mac. Something else worth pointing out about this software is that it’s mobile-friendly. If you have a modern smartphone or tablet, you’ll have no trouble connecting and getting in on the action while you’re on the go. This is a big advantage because it adds even more flexibility than Ignition Casino already has from their software selection and use of bitcoin as a deposit and withdrawal method. The slots available here come from a few different providers that have different philosophies and approaches to how slots are created. With Realtime Gaming, for example, you’ll get games like those from the Real Series that include a lot of wild feature, small progressive jackpots (as a random extra jackpot), lots of bonus features and moderate graphics. The BetSoft titles are a bit different in that they have a bigger focus on great graphics, but they tend to be low-volatility affairs without major jackpots involved. From Rival Gaming, you get titles like the i-Slots, games that have involved storylines that play out differently each time you play. Rival also has more classic slots than most, which rounds out the selection even more. The selection of table games here is pretty strong. Baccarat, roulette and casino poker have a pretty good representation to start things off. However, their deep selection of video poker and blackjack games really stand out as being good for strategically minded players who prefer a bit more skill involved that allows them to influence the average payout rate. There’s also a good mix of other types of non-slot games, including a handful of scratch card titles and keno. All of these games accept bitcoin for play, so you’ll have tons of options to pick from no matter what types of titles you prefer. Ignition just launched their only poker room in August 2016. They actually bought out Bovada’s poker platform and all Bovada players will be migrated over to Ignition accordingly. New poker players at Ignition will be awarded with a 100% match bonus up to $100. Keep in mind that bonuses work a little differently that casino bonus, so the bonus is released in increments instead of being instant. It’s pointless to play at an online casino if you can’t trust that they’ll pay out when they’re supposed to. One of the great things about Ignition Casino is that there’s plenty of reason to trust them, including their reputation and track record for quick withdrawals, even to US players. They offer bitcoin for deposits and withdrawals, but they also offer certain credit cards and direct money transfer services. For withdrawals, they have an additional option for ACH transfers straight to your bank account to make sure that you can always receive your funds. There’s no live chat option here, but they do have email and a toll-free telephone line available. For this review, we sent them a quick email asking a few questions, and we got a response back around an hour later. That’s pretty quick for an online casino today, and it goes to show that we can expect some pretty good customer service from Ignition Casino. Something worth pointing out for players interested in depositing with bitcoin is that they have customer service agents who have been especially trained to walk people through making deposits and withdrawals in bitcoin. This makes things go a lot smoother than they would if you were trying to figure things out on your own, and it’s a great service that they provide that helps them to stand out from the competition. In our opinion, Ignition Casino is one of the best options for US players who want to get in on the action with bitcoin. They have an extremely user-friendly interface with lots of resources for bitcoin players as well as a wide range of games from multiple software providers. It’s tough to find a site that offers more for US players at this point in time in general, in particular for competitors that would accept the bitcoin crypto-currency. Overall, no matter what kind of casino game you’re a fan of, you’ll find plenty to play here with their selection of hundreds of games. Add regular promotions and special offers to the mix, and you’ll get an excellent amount of value for your deposits and your real money play as well, and it’s hard to beat that.